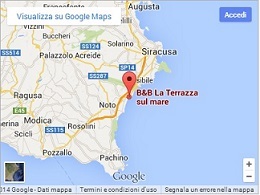 Photos of B&B La Terrazza Sul Mare located in Avola (near Siracusa). The garden is 600 square meters and filled with various palm trees, English lawn, terrace overlooking the sea, and outdoor furniture. It is located along Avola Lido, only 2 km from the historic center of Avola, and in a prime location for visiting nearby points-of-interest, including Siracusa and Ortigia, the baroque town of Noto, and the Natural Reserve of Cavagrande in the hills of Avola, and the Natural Reserve of Vendicari.